The Soviets quickly realized that they needed more firepower to knock out German tanks, and as such they modified their 85mm antiaircraft gun design to fit in tanks and provide the necessary increase in firepower. Two variants were produced: the D-5 from F. F. Petrov and the later ZIS-S-53 from V. G. Grabin. The Ural Factory for Transport Machinery Building (UZTM) quickly modified a T-34 Model 1942 chassis to mount the new gun in a casemate, and starting in August 1943 it entered production and service. But even this gun eventually began to have problems in penetrating the later German tanks, and as a result in mid 1944 a heavier gun, the 100mm D-10, was developed. UZTM Chief Designer L. I. Gorlitskiy modified his SU-85 design to take the new gun, but as production was slow in starting he decided to simply modify it to take either the 85mm D-5S or the new 100mm D-10S on a standardized (unifikatsionnaya) chassis. 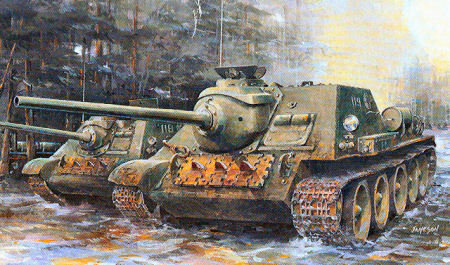 The modified SU-85 became the SU-85M and was produced in parallel with the SU-100 from September to December 1944. A total of 315 SU-85M guns were produced. The main differences between the two externally were the smaller gun and a different mantlet, as the chassis now had the expanded commander’s position with bulge to the right side of the hull and other improvements. DML has now released a “Premium” level version of their earlier SU-85M kit and also included parts to build an early model SU-100.The model has some neat touches, such as totally separate parts for much of the casemate, cupola and gun mounting. There are also separate sides to the casemate, but DML’s directions still have not improved from their SU-100 Premium kit and this is still very fuzzy. They have to be installed in in Step 5 (they are parts P8 and P9 and the upper hull is C7.) While many modelers will probably figure this out (the parts are not “blued out” and it is obvious where they go) it is still something more than one will miss until after other bits are installed. This kit only comes with one rear plates for the casemate without the “dutch door” flap behind the ammo loading/access hatch. The now all too common love/hate relationship with DML kits takes over. They have made all of the grilles separate parts with optional etched brass screens; happily this kit DOES include one with the opening provided. The etched blades for the louvers which are underneath it are included, and unlike the last iteration of these they stand free so there is no brass tab to interfere with mounting the screen assembly when finished. The wheels are the 1944 production disk wheels with solid rubber tires. The “Magic Track” are pretty straightforward by now, but the usual word of caution to leave the idler mounts (A6) loose until you have the tracks ready to install so that you can get the right amount of links to fit. Remember T-34 track links are “A” and “B” ones which do not swap and must be added in pairs. All hatches can be posed open or shut, which is nice, but since the vehicle has not one whiff of interior I am not sure how many will be used. It also comes with a choice between “new” and “slightly used” fuel tanks, so the modeler has an option. The exhausts designed for this kit replicated welded tubes with “slide molded” openings. The kit provides three gun barrels: two 100mm ones (original two-piece type and a “slide molded” styrene one) and a turned aluminum 85mm barrel. The commander’s cupola comes in 14 parts and has the option for either styrene or brass components as well. In point of fact, this kit comes with a plethora of brass parts – tie-downs, louvers, grilles, fenders, trim, and even working snap-locks for the tow hooks. Most have a plastic counterpart, but this is NOT a “Smart Kit” in that regard. Technical assistance was provided by Nick Cortese. Finishing information and a nice sheet of Cartograf decals provide markings for six vehicles: Unidentified Unit, Eastern Front 1945 (4BO green with white 119, “bull’s eye” cockade and white 7A); Unidentified Unit, Poland 1945 (white overall, black 281); Unidentified Unit, Bohemia 1945 (4BO green, white F2); 7th Mechanized Corps, Hungary 1945 (worn whitewash over 4BO green, white K-10); Unidentified Unit, Bohemia 1945 (4BO green, white 432); and Captured SU-100,l 4th Panzer Division, Danzig April 1945 (two color camo, black crosses.) The first three are SU-85M and the last three are SU-100. Overall this is a nice kit and the option to make either an SU-85M or early SU-100 enhances it.